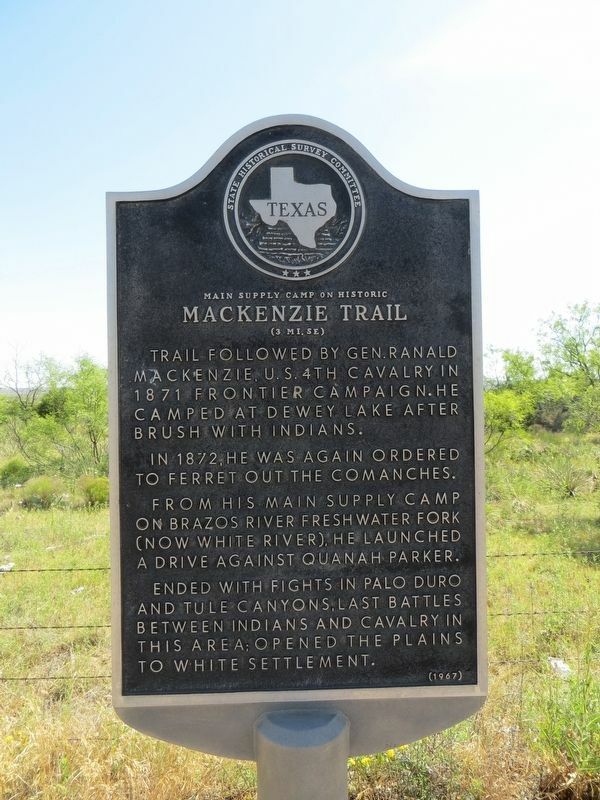 Trail followed by Gen. Ranald Mackenzie, U.S. 4th Cavalry in 1871 frontier campaign. He camped at Dewey Lake after brush with Indians. In 1872, he was again ordered to ferret out the Comanches. From his main supply camp on Brazos River Freshwater Fork (now White River), he launched a drive against Quanah Parker. Ended with fights in Palo Duro and Tule Canyons, last battles between Indians and Cavalry in this area; opened the Plains to white settlement. Location. 33° 39.872′ N, 101° 10.532′ W. Marker is near Crosbyton, Texas, in Crosby County. Marker is at the intersection of U.S. 82 and Farm to Market Road 2591, on the right when traveling west on U.S. 82. Touch for map. 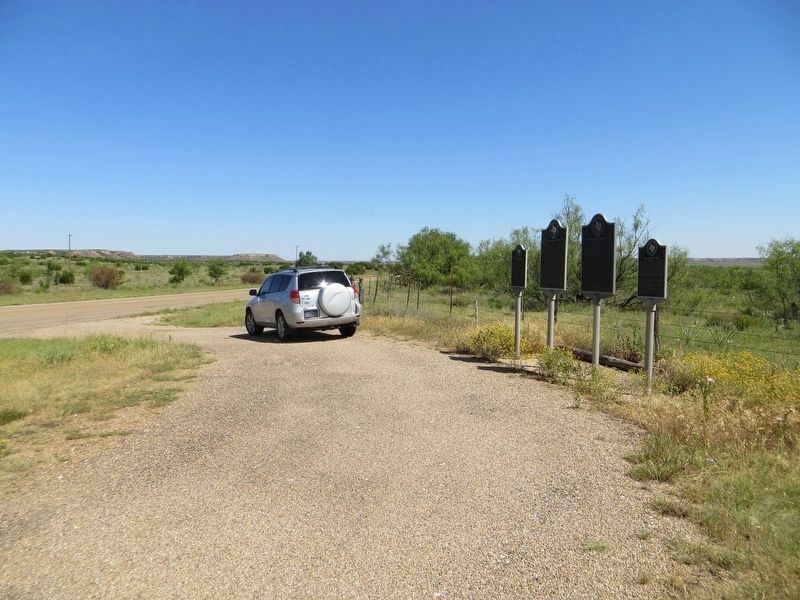 Marker is in this post office area: Crosbyton TX 79322, United States of America. Touch for directions. 2. 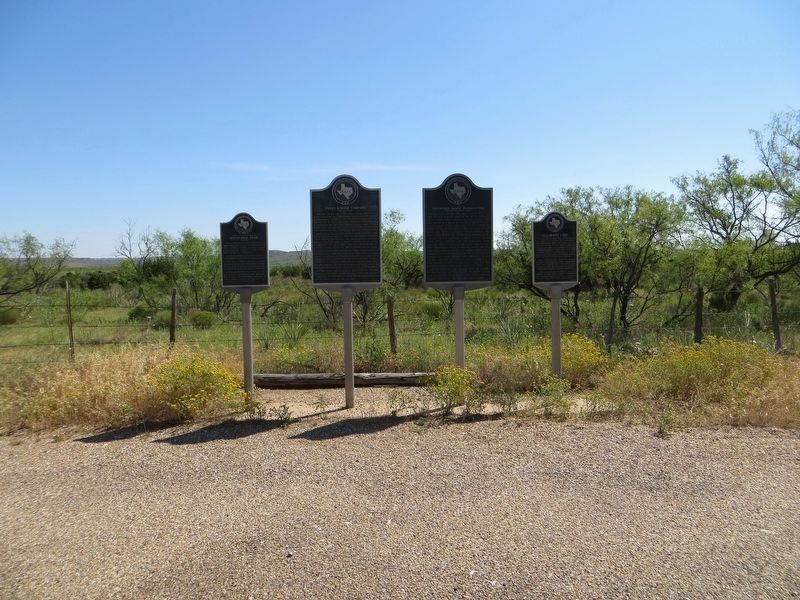 Four historical markers at the intersection of highway US-82 and Farm to Market road 2591. (here, next to this marker); Crosbyton Cemetery (approx. 2 miles away); J. J. Pierce (approx. 2.1 miles away); Lamar Family (approx. 2.1 miles away); Crosby County (approx. 3.6 miles away); The Rock House (approx. 3.7 miles away). Touch for a list and map of all markers in Crosbyton. View north on Farm to Market road 2591. More. Search the internet for Main Supply Camp on Historic Mackenzie Trail. Credits. This page was last revised on July 7, 2017. This page originally submitted on July 7, 2017, by Bill Kirchner of Tucson, Arizona. This page has been viewed 133 times since then and 9 times this year. Photos: 1, 2, 3. submitted on July 7, 2017, by Bill Kirchner of Tucson, Arizona.